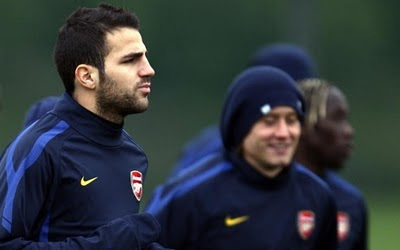 The main news today centres around whether Cesc Fabregas has done enough to battle his way back to fitness and is picked in Arsene Wenger's squad to make the trip to Manchester later. Fabregas was put through a grueling training session on Friday and was not involved in yesterday session with his team mates. Wenger wanting to see whether there were any reactions to the tough session on his captain's body. The manger said at his press conference on Friday that he would make the final decision as to whether the Spaniard is involved. Our away record - the best in the Premier League - is formed of five wins, two draws and one defeat. In our eight Premier League matches away from the Grove this season, Fabregas has been involved in five of them. He played in the games at: Blackburn, Sunderland, Manchester City, Wolves and Everton. So the games Fabregas has been involved in have led to four wins and a draw. That's why I think it is important we take him to Manchester, if there is a chance he could play on Monday. However I would not want to risk his long term fitness if he's not ready. There is no point taking him and playing him in this game if he's going to be out for another month. The ideal man to replace him is Tomas Rosicky. He's had a good season so far and we're starting to see the player we missed for so many months when he was out injured. If only he could find his shooting boots! Rosicky does not hog the central ground like Fabregas does and is not against switching positions with Samir Nasri and Andrey Arshavin so that our attack is more fluid. It also creates a problem for defences when the trio do that as the defenders are unsure of who they should be marking. Samir Nasri has identified why our form is better away from home. "Our discipline and shape is more efficient when we play away and I am quite confident because we can play our game and we know we can score at any moment. "We have to reproduce the kind of form we show away from home to be more efficient at home as well." When you watch the game tomorrow night, you should - if things are going to plan - notice that Alex Song and Jack Wilshere playing in the deep lying midfield roles hold a better line. They are more square to one another than they are at home when only one of them sits in front of the defence and the other just off the defensive midfielder. The other change Arsene Wenger has made is the way we defend corners we are taking. Prior to a few games ago, Bacray Sagna - considered one of the better headers of the ball in the team - would go up into the opposition penalty area for corners. Now you'll find him sat on the halfway line with Gael Clichy. And Sagna isn't getting too upset about what Patrice Evra had to say about Arsenal. "I would never allow myself to criticise another team. "It shows a lack of respect. Patrice loves to wind people up and raise the temperature. "That is his way of doing things, but it does not affect me in any way." To be honest. I have ignored Evra's comments. I treat them like the disdain the French people have for the man. He loves to talk the talk yet I remember when he was getting a going over at Old Trafford last season it was him who was moaning to the referee about the Arsenal challenges. Moaning like a baby. Some Sunday reading for you and there is a nice piece in the Sunday Telegraph about man of the moment Samir Nasri written by Duncan White. And Paul Wilson in The Observer questions who would make the starting 11 in a team off the season if it were picked now. And for my two pence worth, I think he's made a glaring error in attack by not even considering Marouane Chamakh. Team news for Monday's match. Gael Clichy and Johan Djourou return to the squad after missing out on Wednesday night. Manuel Almunia, Abou Diaby and Kieran Gibbs miss out through injury while we are also without Thomas Vermaelen who is still fighting his Achilles injury. Finally, I'd like you to support fellow Gooner Tony Briggs who will be giving up his Christmas day to work for Crisis UK - the national charity for single homeless people. He's trying to reach £100. No matter how little you can give, I'm sure we can all help him reach his target. Go to his supporter page to donate. If you live in the UK remember to tick the Gift Aid box.